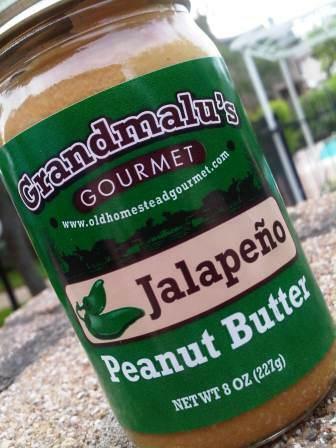 That's right, it's jalapeno peanut butter! So in Rosenberg, Texas, an intrepid foodie with a big mustache is making splash with unique jellies, jams, relishes, and other accoutrements. Brazos River Provisions Company is the brain-child of one Mike Mercado who personally produces most of the products sold in his store (more on these later). But today's post is part of the Old Homestead Gourmet line that he proudly sells to his very loyal clientele. Now in the past I've written about peanut butter stuffed jalapeno poppers (click here for the original post from Aug. 3), so when I saw this innocent little jar of peanut butter I knew that I had to buy it! 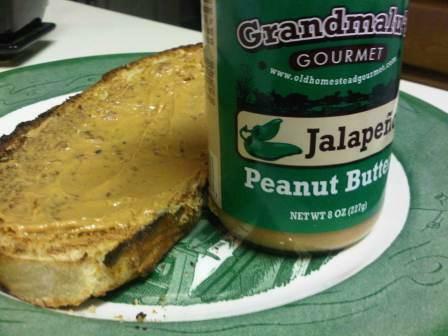 While the peanut butter itself had a velvety texture and rich taste, I found myself surprised by the bite of the jalapeno. Aided by the oil from the peanuts, the capsaicins from the peppers coated the entire palate. What started out as a warm tingle grew to a moderately intense heat. I wouldn't recommend it on toast, but in a Thai-inspired recipe, this butter would feel right at home!